Today’s post is a special one. Many of you know that I am slightly addicted to coffee and you can tell when you scroll through my Instagram or see my snaps on Snapchat. The funny thing is, I did not grow up drinking coffee or caffeine for that matter. It just wasn’t served in our household or encouraged to drink. In a way, I am happy it was like that because to the level of how much I love coffee right now, I just couldn’t imagine the monster I would have been today. Haha! Fast forward to today and to tell you just how busy my life is would pretty much sound like “she is making that up”. Well, I work a full time job along with blogging which is pretty much another full time job. Added to that I have to make time to hang with friends and family and also time for myself. I am always running around, and honestly, I drink coffee to help me through my days. With that said, I almost always have to have my Dunkin’ Donuts® Creamers to spruce up my coffee anywhere I go. I never know where my day will lead me and when I will need my creamers. Instead of carrying them around in a box, I employ this simple stylish DIY mason jar container which makes it even easier, more fun, and so much more functional. 4. Fill your jar up with your favorite flavor/s and you're done. Super easy. I can easily fit my jar in my hand bag and if I'm at the office, It's easy to grab for it from my handbag or my drawer without leaving my desk, saving me time while getting work done. I also love having access to my Dunkin'® Donut Creamers in the car as I tend to head straight to the gym after work and may need a quick drink of flavor in my evening cup of coffee. When I say anywhere, I literally mean anywhere. I even made a jar, filled it up, and gave it to my guy. He keeps his in his glove compartment for days when he needs it. 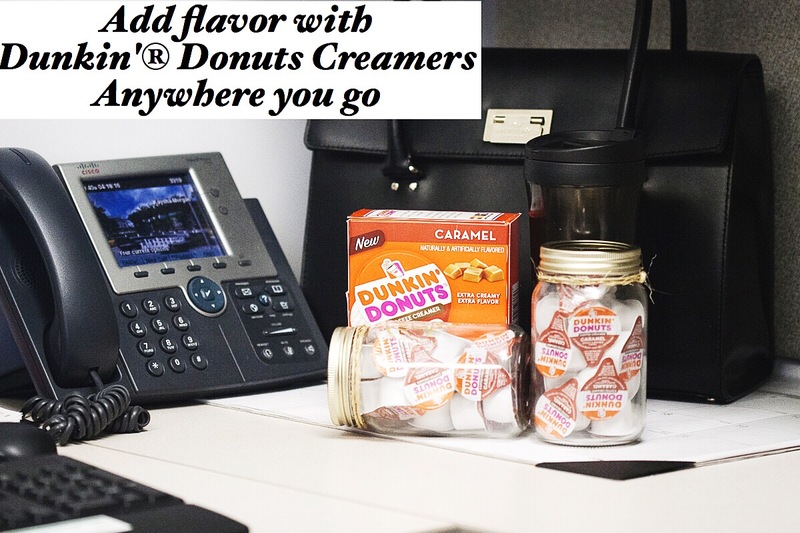 Head over to your local Walmart and in the coffee isle you will find these yummy Dunkin’ Donuts® Creamers. There are three flavors-Hazelnut, Caramel, and Vanilla. I love the caramel, it is extra flavorful and creamy. Now that’s what I call convenience, with style, to help me enjoy my coffee anywhere I go. Have you tried them before loves? Do you plan on trying them? Oh, if you are not a coffee drinker, they are just as good in your hot chocolate or tea. Thanks for swinging by loves, till next time. I am running out the door now to get my creamer for my coffee! Perfect for "dunkin" my Krispy Kreme Donuts...oops sorry Dunkin', all in jest.